While absolute uniformity in the conduct of our Services is certainly unobtainable and probably undesirable, there would appear to be a fairly unanimous desire that they should be marked by a general similarity throughout the Diocese. There is at present no Directory of Ceremonial, set out by due authority, in existence dealing with the Mission as a whole. Whether or not such an authoritative Directory is desirable is a debatable point; but in the meantime it may be useful to summarize the main features which should mark our Ceremonial, and to offer suggestions for ensuring a fairly close similarity in the conduct of our services. And, first of all, Ceremonial should be at the same time, DIGNIFIED and SIMPLE. Everything that adds dignity to our Services generally, and especially the Celebration of the Sacraments, is to be encouraged, but should our people ask us, "What is the meaning of this Service?" or desire to know the reason of some detail of Ceremonial connected with any particular Service, we must have an answer ready. Thus our Ceremonial must be simple, inasmuch as it must be susceptible of a simple and clear explanation. It is not sufficient for each individual to enquire, "What is 'correct'?" Experience teaches us the sad lesson that it is much easier to ask this question than to obtain a satisfactory answer to it. "Doctors differ" as much on this subject as on any other connected with our religion. Nor will it always follow that what is 'correct' or even desirable in one country is correct or desirable in another. It appears to me that our wisest and best course is boldly to strike out for ourselves in the direction of a Local Use. We will bind ourselves to no particular 'school' of Ceremonial, but, setting before us the one object of edifying our people, adopt or adapt such Ceremonial elaboration of our Services as may suit our local and singular conditions. Such a procedure must of necessity be largely of a tentative nature. We cannot expect to devise in a moment, or in a year, a perfect system of Ceremonial, but, if we will constantly repeat to ourselves the phrase, "Dignified but Simple," I believe that in the course of time we shall evolve a Ceremonial that shall, at one and the same time, add the desired beauty and dignity to our Services, and help in the Devotional Life of our people. The Services of the Church may be regarded from two different standpoints. First, that of Children in their Father's House, and secondly, that of Subjects drawing near to their Sovereign. These points of view are complementary rather than mutually exclusive. On the one hand we must put no artificial barriers between children and their Father, but on the other hand we must not allow an undue familiarity to destroy the respect and awe due from a subject to his King, especially from such subjects to such a King. An example of my meaning may be given in considering the Daily Services in our Villages. While the lack of proper or suitable vesture should never be made an excuse for pretermitting a Service, or attendance at a Service, yet it is most unseemly when the minister or the congregation are uncleanly or untidy in appearance. One has heard of a Native alleging as a reason for missing a service that his only pair of trousers was in the wash. This is absurd, on the face of it. But it does not seem to me necessary for a European to attend a Service without his trousers, in order to emphasise the absurdity of the native's excuse. A person may well turn into the village Church for a moment's communion with his Heavenly Father in the clothes he is [4/5] wearing, or with the traces of his work still upon him; nor should the lack of "Sunday Clothes" prevent his joining in public worship, but normally cleanliness and tidiness should be the most strictly enforced minimum for Ministry and Congregation alike in the Public Services of our people. Opinions differ largely as to the desirable vesture of the Native ministers at the Daily Prayers or when assisting, in any capacity, at the administration of the Sacraments. In this matter we need the guidance of very careful self-examination. Perhaps we advocate the general use of both cassock and surplice. Is it really because our European upbringing has made us so accustomed to these garments that we, personally, feel uncomfortable when they are not worn; or is it, in truth, because we consider that the lack of then is derogatory to the honour and glory of God? Perhaps, on the other hand, we advocate the wearing of only a clean 'malo'. Is it really because to our European taste the native is more comely unclothed, or is it, in truth, because we feel that he will be able to concentrate his devotional feelings more freely, unhampered by unaccustomed and often uncomfortable clothes? One thing, in particular, we must be very careful to guard against; that is, following our own predilections, and yet alleging as the reason, that the people like or dislike this or that, when, after all, it is only our personal feeling which is concerned. We must always remember that things which irritate us may not be noticed by a native, or may even strike a native as desirable. Missionaries are often ridiculed for enforcing an 'English' form of services on most un-English people. We must be very careful that we do not try to enforce our European fads and fancies on our people; and above all must [5/6] we avoid saying, "This or that is what appeals, or does not appeal, to the native," when if we were to speak the truth we should say, "This or that is what appeals to me, or what I am used to at home, and it's what the native ought to like, and what I am gong to do." Put baldly thus, we should all declare our agreement as to the undesirability of this kind of attitude, but, it is a very subtle temptation for us who have the task of regulating the Ceremonial of a young Church. To sum up: I take it that we are all agreed that our Services should be conducted "decently and in order," but as to what exactly constitutes Ecclesiastical 'decency' in attire we are not in absolute agreement. Here we find an advantage in a certain amount of diversity, for we may be quite certain that as the native Christians see and consider these diversities of usage, they will gradually form an opinion as to what appeals to their sense of the fitting, and assuredly, in time, give utterance to this opinion. For a time the vagaries of a popular or dictatorial Missionary will be followed, but in due time, the consensus of opinion of the Native Church will be found, and when that is the case, then will be the time authoritatively to draw up and enforce a regulation on the matter. In the mean time I would ask for a very careful and impartial study of the opinions of natives of every class, and for something of a self-denying ordinance with regard to our own individual tastes. The most casual study of our Prayer Book will shew us that our Church adheres to the special observance of certain days and seasons. I can see no reason why we should differ from the rest of the Church here. I do not suppose that any one of us would wish to do so. But there is probably considerable divergence in our various methods of observing these Feasts and Fasts. Of the great Festivals which do not invariably fall on a Sunday, Christmas and the Ascension stand out pre-eminently. To these, in a Missionary Diocese, I should recommend the addition of the Epiphany, as being especially the Feast of the annunciation of the glad tiding of Jesus to the nations. These three Festivals should be observed alike. I should suggest that the early morning be invariably reserved for Worship, and that the day should also close with Worship. Where possible, of course the Holy Eucharist will be the chief Service, and should be celebrated with every accessory that may lie within our powers, to enhance the beauty and dignity of the service. Evensong, at the close of the day, should be marked in the same manner. Where there is no opportunity of a Celebration of the Holy Mysteries, Morning Prayer should be marked with whatever additional ceremonial may lie within the possibilities of a village congregation. A Procession, more music than on ordinary days, and some decoration of the Church, would be within the reach of almost every village. As these days are holidays as well as Holy Days, we should make opportunities for reasonable play and feasting at such seasons. I do not think there will be found to be a very general desire among our people that the Holy Eucharist should take the place of Morning Prayer, in the sense that Morning Prayer should be omitted altogether. But when there is Morning Prayer as well as the Celebration of the Sacrament (and I personally can see no reason why there should not be), Morning Prayer should be said or sung as early as convenient, to allow for festivities afterwards, and with less ceremonial than was used at the Eucharist. There is nothing essentially 'Catholic' or 'correct' in disparaging Matins, nor should there be as yet, thank God, necessity for making our times of Worship few or brief because "people can't stand long or frequent services." On the other hand, the Holy Communion is, and always will be the Chief Service of a Holy Day, and should be marked as such by the Ceremonial employed. The usual custom at home is to observe the Epiphany with an Octave alone. The while vestments of the Minister and Altar are usually changed after the Octave, for Green, and Septuagesima Sunday sees the introduction of Purple. It seems to me that in a Missionary Diocese the Epiphany should be marked as much as the other Great Feasts, and that no particular teaching is involved in the use of Purple before Lent. For this reason, at Siota, we keep White on all the Sundays after the Epiphany, change to Green for Septuagesima and Purple for Lent. This seems to me in accordance with our principle of "Simplicity." It is easy to explain why we keep White throughout the Epiphany Sundays, why at the beginning of a season not particularly connected with any event in our Lord's life or the history of the Church, we change to the neutral colour, and why we mark the great penitential season of Lent with Purple, the colour of woe. 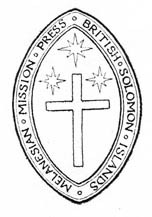 I would venture to suggest that this variation from the usual custom be adopted by us, as it sacrifices no particular doctrinal point, but, rather serves to emphasise our gratitude to God Who has brought us (Melanesians) out of darkness into His most glorious Light, and further marks off so clearly the Penitential Season of Lent from the three, to a certain extent, introductory and preparatory Sundays of Septuagesima, Sexagesima and Quinquagesima. On Easter Day, being a Sunday, the elements of play and feasting are not suitable, or at any rate would offend many if not all of our native Christians; but, of course, the Services will be marked with every possible festal accessory. Whitsunday and Trinity Sunday would be marked in much the same manner. We then come to the observance of Saints' Days and other Holy Days. These seem to me to fall into two categories, Greater and Lesser. Among the greater festivals, I should include all feasts of our Lord and the "Red Letter Days" of our Lady, All Saints' Day, and the feasts of such pre-eminent Saints as S. Peter, S. Paul, S. Stephen, the Holy Innocents, S. John the Divine and S. John the Baptist, together with the Holy Angels. To these I should add S. Barnabas, as the Patron Saint of the Mission, and also the Saint of the local Church Dedication. These days would be marked with some additional ceremonial, and observed with Octaves. The remaining Red Letter Days, including S. Mary Magdalene and the day of the death of Bishop Patteson, would be considered as lesser feasts, and marked as to ceremonial, much as was the case in local Sunday use. The days on which we remember Mission worthies should also be marked, but it would be enough to introduce a Collect of Remembrance at the Chief Service on those days. While we have no general custom as to the observance of "Black letter" days, and the lesser festivals of our Lady, the method of observing these, or the question of observing them at all, must be left to the discretion of individual priests. I would suggest the addition of a suitable Collect, after the Collect of the Sunday, as sufficient Commemoration of the Saint or event. The question of the observance of certain days and Seasons naturally suggests the question of the desirable method of observing seasons of Penitence and Fasting, such as Lent, Advent, Rogation and Ember Days. Circumstances will be different in different localities, and will inevitable affect the observance of these seasons, but some general suggestions may be offered. LENT.--Here the question of Fasting cannot be entirely overlooked. As this also applies to Fridays, Vigils, etc., we may introduce the question of disciplinary as well as ceremonial observance. This is, confessedly, a very difficult question indeed, but its very difficulty seems to me an additional reason for offering such suggestions as I am able to frame, in the hope that they may prove of use to others. Our Church leaves the method of observing a Fast to our own consciences. To suggest that Melanesians should observe days of fasting or abstinence by eating fish, appears to me too ludicrous to need discussion. The indulgence in what is confessedly a luxury, as a mark of penitence, cannot be desirable, even with the intention of bringing Melanesia in into line with Catholic usage. But while the method of fasting is left open, the rule of fasting is clear. But how can we observe it? I am very loath to suggest for our people any rule which we do not observe ourselves, and I cannot find it in my heart to bid my European fellow-workers eat less on one day than on another, as I do not think that we could do our work properly with less nourishment than the majority of us can get at present. I am driven back, then, from the letter to the spirit of fasting. As I understand it, Fasting means, broadly, giving up something we value for the benefit of our souls and the honour of God. What is there that we can give up, which we value considerably, the denial of which will benefit our souls and set forward the honour of God? The only answer that I can find to the question is, 'our time.' I would suggest, therefore, that we ourselves give up a certain definite time on every fast day to Prayer or Devotional reading, and teach our people to observe the same rule. I am conscious that this involves a distinct break with the generally accepted Catholic tradition, and therefore offer it, tentatively, as a suggestion, and nothing more. But, believing as I do, that the question of the due observance of the Fasts of the Church has, in the past, and does now, trouble the minds of not a few among us, I conceive it to be my duty as your Bishop to offer what help I can towards the solution of this difficulty. Such seasons and days may well offer us an opportunity of impressing the duty of alms-giving upon our people, as a means of self-denial and also with a view to promoting the better observance of this duty amongst them and, incidentally, impressing upon them that they should aim at becoming a self-supporting body. For a further due observance of Lent, in every village, where practicable, additional opportunities of public worship and religious instruction should be provided. This also applies to the due observance of ADVENT. Rogation Days are well marked by Processions. There may be one procession through the village and the gardens, or there may be a smaller procession on each of the three days, the objects of Intercession being spread over the three periods. This is the custom lately introduced at Siota, with a further innovation (intended mainly, I fear, in the interests of a Bishop heavily robed), of having the processions at night, with lights. This proved to be very impressive. The Procession started each evening from the Church, and returned to the Church, whereupon Evening Prayer was said. On the eve of Ascension Day we left the Church in comparative gloom, and returned to find it ablaze with lights for the first Evensong of the Ascension. The effect was beautiful and susceptible of obvious meaning. I believe the evening processions were appreciated by the natives as well as by the Europeans. They would have an obvious suitability to village communities, as every one would have returned from his or her work by that time. Every person should be encouraged to take part in these Processions, plenty of hymns should be sung and 'Stations' for suitable local intercessions made at about four different places each evening. On Ember days, the Collect, Epistle and Gospel (where a Celebration is possible), and the Special Litany provided in the New Prayer Book, should be used, at least, on one of the Days. The Ember day prayer will of course, be read daily at morning and evening prayers. I think that while Matins and Evensong should, normally, be said in full on Sundays; on week days, our daily services are better in the form of something akin to 'Family Prayers' taken for every one in Church. The form may be that of the Short Form provided in the Prayer Book, or an adaptation of Matins or Evensong, or might even be left largely to the discretion of the Priest in charge; but the old custom of the people gathering together naturally morning and evening for common prayer should never be allowed to lapse. Our converts should be taught to accept this as a normal result of being Christians. Daily Celebrations of the Holy Eucharist are almost a necessary part of the life at Colleges and large Schools, but I do not believe that any of our village communities are, as yet, ripe for this great privilege. I feel that it is right to mark the daily services on Sundays and the greater festivals by a more formal vesting of the minister. Where the Minister is in Holy Orders this may be done by the wearing of the Scarf or Tippet; in other places by taking care that whatever dress is worn shall at least be scrupulously clean. Probably the Litany might be used even more frequently than is the case at present. It is a very beautiful and suitable form of Devotion when carefully and reverently taken. It should form part of our public prayers at the very least once a week. Every one should practise and inculcate the greatest reverence and care in the conduct of all our public devotions. Especial attention should be paid to the reading of prayers and lessons, and to the making of the responses audibly and intelligibly and intelligently. N.B.--The Collects are generally read by the Minister, when in Priest's Orders, standing. The Holy Communion is celebrated at Siota with three differing degrees of Ceremonial. On week days, with Celebrant and Server alone; on Sundays and ordinary Festival days, with Celebrant, Epistoler and Gospeller; on Special Festivals, with Celebrant, Deacon and Subdeacon (vested in Tunicle and Dalmatic), Server, Crucifer, Taperers and Thurifers; thus marking, Ceremonially, the different 'values' of different days. The ministers enter the Sanctuary form the vestry in the following order: Crucifer, Taperer A, Taperer B, Thurifer A, Thurifer B, Server, Subdeacon, Deacon, Celebrant. They enter in single file owing to the structural conditions of the Church. Where conditions permit, the Taperers and Thurifers would walk side by side. Thurifer. Thurifer. Crucifer. Thurifer. Thurifer. Incense is only (at present) used at the Introit, in accordance with the rule of Simplicity, the censing of persons and things being not very easy of a simple explanation. The Cross is put in its position at the East wall. The Tapers are also held one at each side of the Deacon as he reads the Gospel. On these days Hymns are sung for the Introit, Gradual, Offertory, Communion and Ablutions; on the days of the second class, Hymns are only sung for the Introit, Offertory and Ablutions; on ordinary days the service is said without Hymns. After the Service the various minor assisting persons go out without ceremony, this again is owing to the structure of the Church at Siota. The present use, especially as regards Incense, is tentative. Further elaborations of Ceremonial may develope as seems compatible with our rule of Dignity and Simplicity. 2. Mark clearly the difference between certain Festivals, and between Festival and ordinary days. Much of it is at present impossible in Village Churches, but the principle seems to me to be right and easy of attainment everywhere. Another way in which the differences are marked at Siota is by the number of candles set about and around the Altar. This is a very easy and simple method, and one that, I think, appeals to the people generally. It is easier and more cleanly than the use of flowers for decoration, on or around the Altar, though it is open to question on aesthetic grounds to the minds of many of us. But . . . is it open to question on these grounds to the minds of our people? This, I conceive to be the real thing to ascertain, and, indeed, the only thing that really matters. The general idea that has guided us at Siota is to take as out foundation the English Use (as set forth by the Alcuin Club), and alter and adapt it to suit our local conditions. We wish it to suggest that, while we are Melanesian first of all, we are, at the same time, English in our Ceremonial. A brief summary of the ceremonial of the Celebrant as in general use at Siota may be of use. The priest on reaching the Altar places the Vessels, covered with the Burse and Veil, slightly to the left of the centre. He takes off the Burse, takes out the Corporal and Fair Linen Veil, stands the Burse on end just in front of the Cross, spreads the Corporal and places the Fair Linen Veil, still folded, slightly to the right of the Corporal, places the Vessels, still covered with the Veil on the Corporal, finds the places in the Book, and goes to the foot pace below the Altar Pace, for his private preparation. N.B.--Right and Left refer to the Priest's right and left hand as stands facing the Altar. Then proceeding to the Altar, he says the Lord's Prayer in a low but distinctly audible voice, and the Prayer for Purity in a clear and audible manner. Whether he recites the Decalogue or no he always prefaces the Collect with the words, "Let us pray." He reads the Epistle, facing the people, clearly, distinctly, and above all, audibly. The Server moves the Book to the Gospel side. The Priest gives out the Gospel as follows:--"The Holy Gospel is written in the chapter of the Gospel according to S. ., beginning at the verse." If he has said the above facing the people, he turns to the East and makes the sign of the Cross while the Congregation say, "Glory be to Thee, O God,"
Then facing the Congregation he reads the Gospel. He then turns to the East while the Congregation say, "Thanks be to Thee, O Lord." N.B.--The 'Ascription' and the 'Thanksgiving' are said by the Congregation alone. Then, moving the Book into a position convenient to himself, he begins the Creed, standing at the centre of the Altar, facing East. At the words, "And was incarnate" he makes a profound reverence, remaining in that position till he has said, "and was made man" when he resumes an erect position. N.B.--It is customary to say these words in a low tone, but they should still be audible to the Congregation. It is very confusing for the Congregation, who should all desire to say the Creed with the Celebrant, when they have to make a real effort to hear him at all. At the end of the Creed he makes the sign of the Cross, and immediately proceeds to say one of the Offertory Sentences. He then takes the Veil from the Vessels, places it at the extreme right hand corner of the Altar, with about one third of its length hanging over the front of the Altar. He then removes the Pall, placing it upon the folded Fair Linen Veil, places the Paten on the Corporal, takes the Purificator off the Chalice, wipes the interior of the Chalice, in case of a speck of dust being present, places the Purificator in a position handy to himself, receives the Breads in the Paten from the Server, who should be standing ready with the Breads on the Credence Paten. He places the Paten on the right hand corner of the Corporal, covering the contents with the folded over corner of the Corporal. He then takes the Chalice and pours in sufficient wine and a very little water. He replaces the Chalice on the Corporal, covering it with the Pall. He then receives the alms (when there is a collection), offers them with a silent prayer and places them on the Altar, and the right hand side, behind the Veil. He then proceeds to the Lavabo. He then gives out any notices necessary, and says, "Let us pray for the whole state," etc., facing the people, who should remain standing till then, if there has been a collection of alms. The Celebrant should never dawdle over preparing the Elements, as it is very irritating to the Congregation to have to stand, doing nothing, while he is fumbling over an act which he should be able to perform quickly, reverently and without mistakes. It is very necessary, too, that the Server should be properly trained to be ready at hand. The Celebrant should never have to wait for the Server. In the Prayer for the Church Militant it is not 'correct' to make a perceptible pause after the petition for the suffering or the commemoration of the Departed. In the Mota Prayer Book it is permissible to insert at the points the names of those for whom the prayers of the people are desired. The Invitation should be said, facing the people, clearly, audibly and naturally. It then cannot fail to be impressive. The Confession is frequently started by the Server, but whoever leads in its recitation should remember that he must say the words clearly and at such a pace as to make it easy for the congregation to say it with him. The Absolution, Comfortable Words and Sursum Corda are, of course said facing the people. In raising the hand or making the sign of the Cross at the words of Absolution, the hand should not be raised higher than the shoulder. Let a man try raising the hand and arm well above the shoulder, before a mirror, when he is wearing a loose-sleeved albe (probably without a cassock) and he will see the reason for this. In all his actions the Celebrant must remember the congregation. Some of them are sure to be watching him at times, and anything grotesque on his part would be likely to catch their eyes and interrupt the current of their devotions. This is the reason for the most minute direction given to Priests of [17/18] the Roman Communion. We need not follow them to the letter, but in the spirit we cannot do better than keep close to their guidance. The Priest should say the Prayer of Humble Access, kneeling in an erect position, as he is more easily audible thus than when crouching, and can still say this prayer in the low tone that its words seem to dictate. He should never pray kneeling with his elbows on the Altar. There should not be more delay than is necessary for the Priest to collect his thoughts between this prayer and the Consecration. The time necessary to say, e.g., the Benedictus qui venit and a Collect, such as that for Michaelmas-day, is enough. The Consecration Prayer should be said all through in a level tone, distinctly and audibly. It is perfectly clear that it is not intended to be the private act of the Priest, but a sacrament in which all present can and should unite. There is no need to try and be dramatic or impressive. Said reverently and distinctly the words need no efforts on the part of Celebrant to render them impressive. Before beginning the prayer the Celebrant should remove the Pall and turn back the corner of the Corporal which covers the Paten. At the Consecration the Priest takes one of the Breads in the first finger and thumb of each hand, he breaks the Bread by making a small tear in it, or if large Breads are used, by actually breaking one. Holding the Broken Bread, he covers the contents of the Paten with his hands and says the Words of Consecration. It is customary to make a deep reverence between the words, "given for you" and "Do this," adoring the Sacrament silently, with some such phrase as, "Hail, True Body of my God." Then rising, he slightly elevates the Broken Bread still held between the first finger and thumb, as he says, "Do this in Remembrance of Me." He then replaces the Bread on the Paten, covers it with the corner of the Corporal, and with first finger and thumb of [18/19] each hand still joined, he proceeds to the Consecration of the Chalice, with similar reverence and slight elevation at the similar words as in the Consecration of the Bread. The response "Amen" should be made clearly and audibly by the Congregation. This is the period most natural and suitable for the Celebrant's private devotions. They may take the form of prayers said silently from other Liturgies which provide for the Priest's devotions here, or any other form which the individual may prefer; but one thing must always be borne in mind, the Celebrant's private devotions must not be so long as to cause uneasiness to the congregation. A noticeable pause at this moment is generally acceptable to all, as giving an opportunity for private devotions, but it should not be unduly prolonged. The Priest should communicate himself standing, silently saying to himself the words of administration. It is not necessary to change the second person to the first, he may consider these words as spoken to him by his Master. In communicating the people it is customary, at Siota, to begin at the Gospel side, i.e., at the right hand end as the Priest faces the people. While administering the Bread the Chalice should be kept covered by the Pall, and while administering the Chalice the Paten should be covered with the corner of the Corporal. It is not desirable to make a reverence as one passes the one Species on the Altar while carrying the other. The edge of the Chalice should be cleansed with the lips before covering it with the Pall. The Pall should never be stained with wine-marks. After communicating the people, the Priest covers the Vessels with the Fair Linen Veil, and after making a deep reverence, begins the Lord's Prayer. At the Blessing the Priest should stand in such a position as to avoid directly turning his back on the Elements, and should not unduly raise his hand. Turning to the Altar the Priest makes a deep reverence, and consumes all that may remain. The Server should be standing in his place by the Altar, awaiting the moment when the Priest shall be ready to take the Ablutions. A small quantity of wine is first poured into the Chalice, and drunk by the Priest; then the Priest takes the Purificator between the first and second finger of his left hand, and wine and water are poured over his joined first finger and thumb into the Chalice. He wipes his fingers on the Purificator, drinks the contents of the Chalice, and with thumb and finger no longer joined, brings the Paten. A little water is poured into the Paten and thence into the Chalice. The Priest drinks this after first wiping the Paten, then wipes his lips, and then cleanses the Chalice. He places the Purificator in the Chalice, and the Paten and Pall upon it, covers both with the Veil, and replaces the Corporal and Fair Linen Veil in the Burse, which he places upon the veiled Vessels. Nothing should be put upon the Burse; books, spectacles and the like should be left on the Altar and removed later on. After the Ablutions have been taken the Server should stand immediately behind the Celebrant, bow when he does, and precede him into the Vestry. The Server need not remove his surplice (if he wears one) before returning to extinguish the candles. These directions are for a Plain Celebration but should be followed, with the necessary changes, at all Celebrations. With regard to the other Services there is not much to be said. HOLY BAPTISM should be administered with every adjunct of Ceremonial which may tend to enhance its sacredness and importance in the eyes of our people. The same applies, especially to us in Melanesia to HOLY MATRIMONY. It should, wherever possible, be performed in the early morning, and followed immediately by a celebration of the Holy Communion. The throwing of rice or 'confetti' should be strongly reprobated. For our people the insistence on the sacredness of Marriage is so important that any custom however harmless in itself, which tends to obscure this point of view, is undesirable here at the present time. In the same way the CHURCHING OF WOMEN should be rendered as impressive as possible for our people. The sacredness and mystery of marriage and child-birth need emphasis for our people to a degree not always recognised by those accustomed to the way these are treated among more advanced races. 1. The Congregation must be considered first. 2. Ceremonial must be edifying, not merely decorative. 3. As our Religion is primarily Sacramental, the pre-eminence of the Sacraments is in all ways and at all times to be emphasised. This word is used very loosely in general talk. If we take it in the strict sense of 'the only right method.' There is NO 'Correct' use in the Church of England, probably never has been, more probably still, never will be. We can use 'Correct' of very many ceremonial acts, of which perhaps we do not personally approve; but we must be very careful how we use the corresponding word 'incorrect,' and not employ it as forbidding what we personally dislike or are unused to.